Donald Trump delivers a prepared speech at AIPAC on March 21. ... And then Trump took the stage. No, not as the final speaker but, unexpectedly, the penultimate one. Everyone looked around; where were the Reform rabbis who were going to get up and leave? How many were they supposed to be, a thousand? Two thousand? Nothing. There were awkward cheers and applause, the blobby shape of politeness, and suddenly it was clear that Trump was reading a prepared speech. He wasn't winging it, free associating, but carefully reading prepackaged points to a specific audience. No one knew how to react; Tweets snarked on the awkward and halting delivery. Ha, he's not such a good reader, is he? But then he began to zero in, he relaxed, he paused, and mugged, and waved his finger, reading the room, ad-libbing more and more. High quality demagoguery is hard to find these days. The words "fascist" and "racist" are thrown around too freely as epithets and have lost their meaning as definitions or categories. But seeing an experienced demagogue at work is a special experience; you don't really know what you're experiencing. You, the average well-educated, well-intentioned listener, sit there with your stubborn preconceptions, smug in your ability to filter fact from fancy, hyperbole from reality. But with a rising and falling cadence, the repetition of 'believe me,' the mugging, the finger waving, and – it must said – the recitation of actual facts about Iran, Palestinian incitement and terrorism, the crowd – you, even you – are sucked in. Seeing a skilled demagogue at work is a special experience. "Believe me," he said, over and over. Of course we don't believe you, you don't even believe you, do you? Or maybe, just maybe, he does believe himself. By sheer repetition, by understanding that crowds really do want to believe in something today, to hang on to something that is not a shadow, that has substance, resistance is worn down. It didn't really matter what he said, but the way he said it. He stayed close to his script and avoided disaster and sounded sort of sensible, on the Iran deal (it's a bad deal), Palestinian terrorism and incitement, and more. Trump's particular gift is to take a sensible observation and make it sound outrageous (illegal immigration, terrorism, whatever) and to fix it in your mind through excess. He's right, but he's wrong, but he's right, also confuses matters by its nonlinear structure, as of course do his more wacky statements. So what if he walks everything back? But are we supposed to be outraged by that, or the original statement? Does he really believe that NATO is useless, like the UN? Who knows? So what if he said the other day that he could be neutral between Israeli and Palestinians. Maybe this way he confuses friend and foe alike. Few took heed of his use of 'Palestine,' not Palestinian Authority. This is instantiation, the giving of substance to something, not perhaps to create a Palestinian state but to bury it. And there was nothing about closing the borders, or hating all Muslims, or building a wall, which Mexico would pay for. But there was Palestinian incitement, and the murdered American, Taylor Force, and the Iran deal. It's a bad deal. Trump's performance was simultaneously masterful and preposterous. It was simultaneously masterful and preposterous. But the willful suspension of disbelief is intrinsic to the show. Why should American Jews be any different than the hundreds of audiences who have been willingly taken in? Why should they be so much smarter? Another stupid conceit that, when applied from the outside, is more than a little antisemitic. The essence of the con is knowing you're being conned, subconsciously appreciating being conned, because it flatters you. Jews are no different. 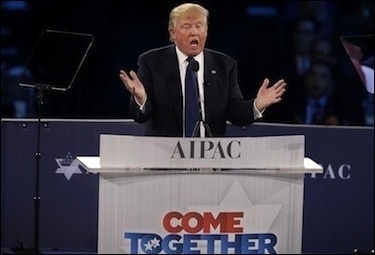 The essence of AIPAC is first being flattered by politicians, then attempting to hold them to their promises with lobbying and political pressure. But Trump confounds this; he is only of the moment. How do you put pressure on a shadow whose shape changes from hour to hour? But is he so different than Hillary, who said more or less the same things as he did, minus the embassy moving and the rhetorical flourishes and the orange face? The most frightening thing to pundits was that Trump could be under control, that he could calibrate, that he sounded almost sane and plausible, that he could connect even with this audience. They've seen the Keyzer Soze trick a million times — "The greatest trick the devil ever pulled was convincing the world he did not exist" — but it still scares them, because the keep getting fooled. But that says more about them than Trump. Maybe they're scared because he's not different in category than Hillary, only in degree. Only two lines — "[Obama] may be the worst thing that ever happened to Israel, and you know it" and "Yay! Obama is leaving" — showed a real spark of subversion, and, of course, Trump's secret access to the collective id. Of course it was applauded. Because he was right. Of course, the next day, AIPAC issued a condemnation, saying that it really, really respected our president, and that some people's feelings were really, really hurt. Because they do, they were. The specter of a Trump blowup hung over the entire affair; damage control is a well-rehearsed dance routine, hardly Fred Astaire and Ginger Rogers, more of an improvised throwdown. Everyone expected worse. Of course, The Affair of Trump at AIPAC will be turned into the Worst Insult Ever By a Racist Who Shouldn't Have Been Invited That Tarnishes AIPAC and the Entire Jewish Community. But the damage done? Only in the eyes of those who obsess over every word uttered by, for, in front of, in the context of, in the general vicinity or penumbra, of Jews. That is to say, first and foremost by official Jews, and antisemites, followed by Jews who Fret, then by those Who Care, and finally everyone else. Trump, the uniter. People cheered, loudly and repeatedly, when they were told things they wanted to hear. As for the protests, the promised walkouts, these were shadows, camera phones theatrics invisible to spectators, much less official feeds. So much for strident statements from movements and magazines alike, puffed up talk from righteous moralizers taking a Bold Stand against Racism. Of course, the focus will not be on them but on AIPAC -oh my God, did you hear the applause? AIPAC fell for Trump, AIPAC supports Trump, American Jews are racists and fascists because they laughed at his jokes. Of course, it's never about the moralizers, it's just about the Jews. All of them. Which is to say, it's really about the feelings of moralizers, the League of Indignant Jews and their self-image as The Kind and Caring Jews™. People cheered, loudly and repeatedly, when they were told things they wanted to hear. The shame of responding to a con man is hardly greater than the thunderous applause that had earlier greeted a felon, guilty of numerous violations of the Espionage Act and lying before of Congress (remember, her bathroom server -is- the smoking gun). No shame there? Go read 18 U.S. Code § 793 — Gathering, transmitting or losing defense information. Alex Joffe is editor of The Ancient Near East Today, the monthly e-newsletter of the American Schools of Oriental Research, and a Shillman-Ginsburg Fellow at the Middle East Forum.